Playwright Ginger Rutland, whose work is being staged this month by the Sacramento Theatre Company, will be featured at the 2019 Authors Luncheon on Saturday, April 27, from 11:30 a.m. to 2:30 p.m. at Plates Café. Please note the election of our Branch officers for the 2019-20 year will also take place at this meeting. Rutland, a former editorial writer for The Sacramento Bee, will talk about the challenges of transforming a book into a play and getting it produced. Her play, “When We Were Colored, A Mother’s Story,” is an adaptation of her mother Eva Rutland’s memoir of the same title. The production opened March 20 in Sacramento Theatre Company’s intimate Pollock Theatre, 1419 H St., and will run through April 28. Branch members wishing to see the play may purchase tickets by contacting the Box Office at 916-443-6722 or online at tickets.sactheatre.org. The play tells the story of a black middle-class family, progressing from the Jim Crow South, through World War II, the civil rights movement, the black power era, and finally to the racially blended families of today. Ginger Rutland moved to Sacramento with her family in 1952. Her father was a civilian administrator at McClellan Air Force Base. 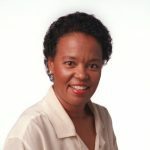 She is a graduate of Howard University and worked for KCRA-TV in Sacramento, as well as KRON-TV in San Francisco, before joining The Sacramento Bee Editorial Board in 1988 as an associate editor. She lives in Sacramento with her husband, Don Fields. They have a daughter and a grandson. There are two ways to register for the Authors Luncheon. Either register on Eventbrite here and pay with a credit card or, if you prefer, to pay with a check, download the registration form by clicking here and mail it with your check to Dawn Boyd. This entry was posted in Author's Luncheon, Newsletter on April 4, 2019 by angelascarlett.